Someone in the room had an alarm clock in their jacket which started going off at 0545 and went off every 15 minutes after that. Of course, the woman whose alarm it was was in the shower the whole time and never heard it. But the 15 people trying to sleep sure did. The sun was finally out and I could wear my sunglasses. I was feeling strong and decided to take a detour to see the church at Eunate, a very old Romanesque style building in a nice setting. Since I had left the albergue early, I was at Eunate by 0800. There were a few pilgrims there, sitting on the grass, catching the sunshine on the low rock wall surrounding the Church, like turtles in the sun. My friend from the albergue in Uterga, Antonio, was waiting and I shared some Voltaren for his swollen knees. Unfortunately, the Church didn’t open until 1030. Who knew that a church would not be open for business on a Sunday morning? I changed my plans and decided to wait until the church opened. It was supposed to be very nice inside, in an austere sort of way. I fell asleep in the warm sun, the silence occasionally broken by Sunday morning power paragliders buzzing around the fields. Eventually, 1030 arrived. How did I know? Because at 1029, two tour buses full of visitors pulled up to the church. The woman who gave the stamps for our credencias, however, was the same who gave the Church tours and the paying customers came first. I was finally able to leave at about 1115, having taken a glance at the inside of the church (Ehh) and gotten my stamp. I arrived in Obanos in time for noon Mass at St. Juan Bautista so of course I went, the only pilgrim in a congregation full of families and friends.. I got to Puenta de la Reina and decided to stay instead of moving onto the next town, as I had originally planned. Waiting for the church in Eunate to open, then stumbling upon noon Mass in Obanos was clearly the work of my entourage of saints making sure I did the right thing and slowed down. Assigned to a room – and stuck with a top bunk – I was surprised to find that I was in the same room as Antonio, the friend with the bad knees who I had met the night before in Uterga, Petra, whom I had first met when we were at the same gite on the first day in St. Jean, and Antoine, my friend from the train ride from Paris. The Camino is full of surprises. Before the Pilgrim Mass that night, I had tapas with two very jovial Spanish gentlemen at the bar next to the Church. How very Catholic that there should be a bar next to a Church. They showed me the ins and outs of ordering and eating tapas and wine. They had everyone laughing, including the bartender, and they were delighted to discover that I was from America. 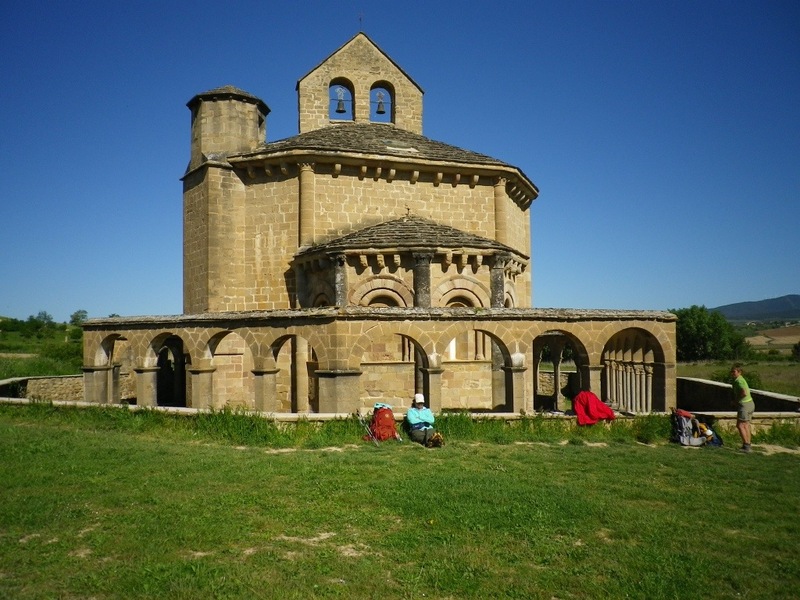 This entry was posted in camino de santiago de campostella, Religion, Travel and tagged backpack, Camino de Santiago de Campostella, Catholic Church, pilgrimage, Saints. Bookmark the permalink.